Sorry for the weird lighting in this post. Apparently I chose a bad time of day to take photos. High on my list of items to look for are silky blouses, especially in pretty colors and interesting prints. During the holiday sales, I found many from various designers that made me swoon, but I was sadly faced with the truth that most clothing is not made for someone my size. I had to stage an intervention on myself after I agonized over a beautiful silk Kelly Wearstler blouse. My mind raced through all my options before I made myself walk away. Could I get it altered (a long list considering the shoulder, length, sleeve, and width of the size 0 were all enormous on me), or maybe just wear it underneath other items to hide the poor fit? 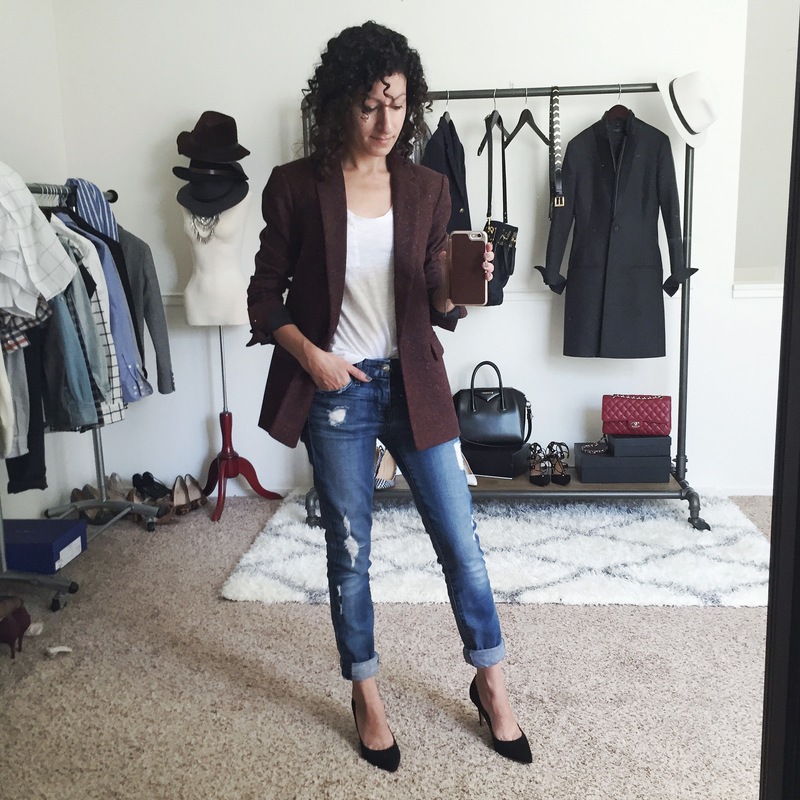 Without sacrificing a huge sum of money on alterations or a good fit, I found myself settling on hoping the usual suspects of Ann Taylor, LOFT or Banana Republic would come out with something interesting. It pains me that my shopping options are so terribly limited. Luckily Ann Taylor has come through with a few silky blouse options that piqued my interest in their new spring arrivals. During a recent 40% off promotion, I picked up the Silk Button Tab Long Sleeve Shirt in Bright Royal Blue and the Graphic Looms Print Blouse. Wow! This color is absolutely gorgeous and the main reason why I’m tempted to keep this blouse. This silk/spandex blouse has a hidden placket, button tab sleeves, and working chest pockets. Typical of silk blouses, the fit is roomy, which unfortunately means a trip to the tailor for a slimming on me. See Cher’s review of this blouse. I’ve been especially interested in printed blouses, since my wardrobe is full of so many solids (snore! ), so when this blouse popped up online I was really excited. I saw it in store in regular sizes and was convinced it was silk at first touch. It has a crepe texture to it, which I was surprised to see was actually polyester after investigating online. This disappointed me as I’m not a fan of polyester, but I had to give it a try anyways. This blouse didn’t photograph very well, but I think you can get the jist of it. 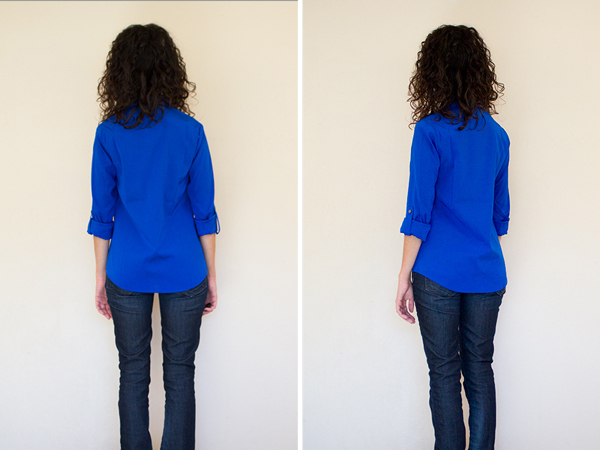 The fit is slimmer than the button tab blouse, but could still use a slimming on me. 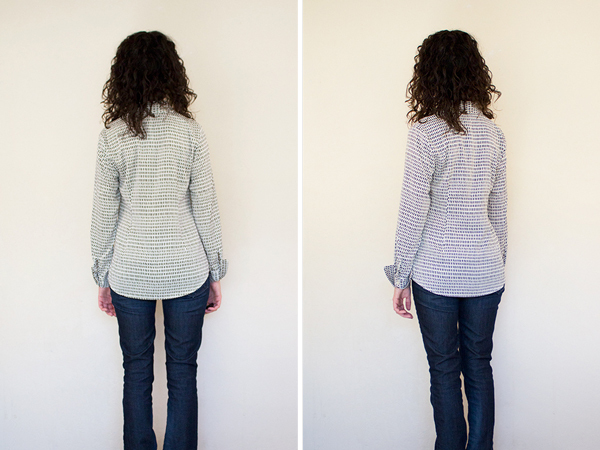 This blouse features a lot of seaming which creates a more feminine shape, slim button cuffs (I needed to unbutton the sleeve in order to both put the shirt on and take the shirt off), and a very slightly rounded collar (the button tab shirt has a pointier collar). I like the high contrast graphic print for it’s simplicity and interest. I’m not a fan of florals, so I’m often hard pressed to find prints that I do like. This one fits the bill. I had never seen this kind of cuff before, and after doing some Google searches, I discovered it’s called a “turnback cuff”. It’s a menswear style that was popularized by none other than Sean Connery in the James Bond series! It’s a unique and bold detail even for most menswear aficionados, so it’s interesting that Ann Taylor would make so bold a choice. I have a feeling a lot of women will be confused by this strange looking cuff. While it looks a little weird on it’s own, it’s actually very nice for folding over blazer cuffs for a peek of fun print, which was the first thing I tried after scratching my head over what to do with this crazy cuff. 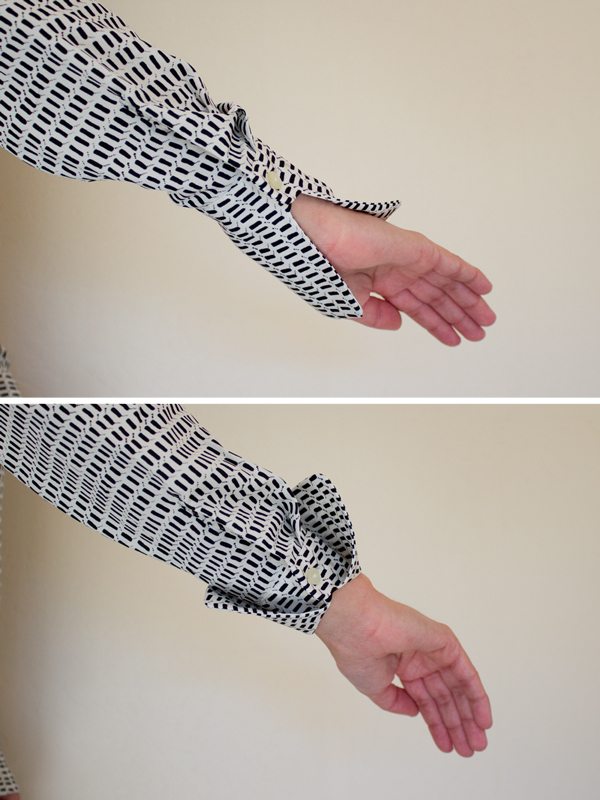 I think this cuff would have been more successful on a crisp cotton shirt rather than a flowy blouse, since it would fold back a little stiffer instead of appearing floppy. Maybe playing with different folding techniques will help. Between the better fit, more wallet-friendly price, and interesting print, I’m thinking this one is a keeper. Even that turnback cuff, as odd as it is, is slowly growing on me. Has anyone else picked up these blouses? What are your thoughts? I’m so happy you reviewed these blouses. I wanted the blue one for a few weeks now, but I ended up purchasing the Fireside Blouse, which doesn’t seem to be available online in Petite any longer. It’s 100% Polyester, but it feels like silk. It fits beautifully, and the color is gorgeous. I’m excited to try one of these two when they go on sale again. I love the cobalt blue color of the first blouse! Ugh, I’m so sorry that all these silk blouses have to be altered to fit you. I’m curious if you’ve ever tried one of those Asian websites like yesstyle? Even pre-babies, I was considered medium to large in Asian clothing (though the quality can be sub-par). I’ve thought about it, but the sub-par quality has me worried. I’m also always reluctant to purchase from sites where I can’t return for free since so many things don’t fit, I’d waste so much money just on return shipping. Try thrift stores! Little old ladies were smaller back then and also only seemed to wear silk blouses (at least if my grandmothers are a good example). I bet your thrifts are picked over in the city, but if you ever find yourself in a smaller town, especially Midwest-ish, give it a try! I have been hunting for a bright colored blouse recently and your post just came! Thank you so much for the details. I love both of them on you. My local Ann Taylor store doesn’t carry OOP, I will order the blue one online. Thank you for the review! Oh, I didn’t realize the Graphic Looms Shirt had a french cuff (I’ve never heard of the term turnback cuff). Kind of kills my lemming. I’m not a huge fan of them on women. I have a few older shirts with them and it makes it a little less versatile because they are harder fold to the elbow. Love the blue on you though! That Graphic Looms Shirt really looks good on you. Cuff is interesting too. I even like without jacket. I’m not huge fun of these print, but cuff matches well with this cuff. I tried on the Silk Button Tab Long Sleeve Shirt and like it but will wait for a good sale. The turnback cuff is interesting. I like that little details on clothes. Make the clothes unique. Love that the graphic print is machine washable! One of these days I will get over my annoyance of visiting a dry cleaner! :p And it has a menswear-inspired cuff…so you! It’s definitely interesting seeing how both shirts fit on you. I’ve been avoiding buying actual blouses like these, just because they never really fit well or look good. Have you tried on the new drape front blouse? I’ve been eying that one. You mean the drape front shell? Nope, haven’t tried it yet. I love the AT blue blouse! However, when I went to the stores, there were no size small left! Have you tried j crew’s Blythe silk blouses? They come in petite sizes. I’d be curious to see how they fit, if you get the chance to do a review on them. 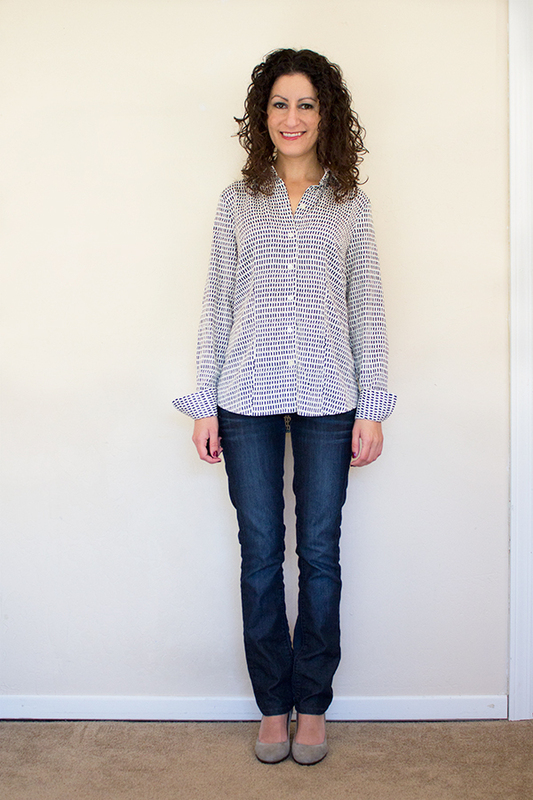 As a matter of fact, I did try the Blythe blouse during the crazy holiday sales. It wasn’t even worth posting on the blog since the fit was so big. If you’re a size up from me, you can probably wear the size 00p, but if you’re closer to my size, you’re better off with Ann Taylor or BR silk blouses. I love turnback cuffs(didnt know it was called that)!! Growing up I had a few shirts with those cuffs and I loved it! Love the blue on you!! I think the graphic Looms blouse is fun! I’m not crazy about the blue blouse – it seems stuffy to me. 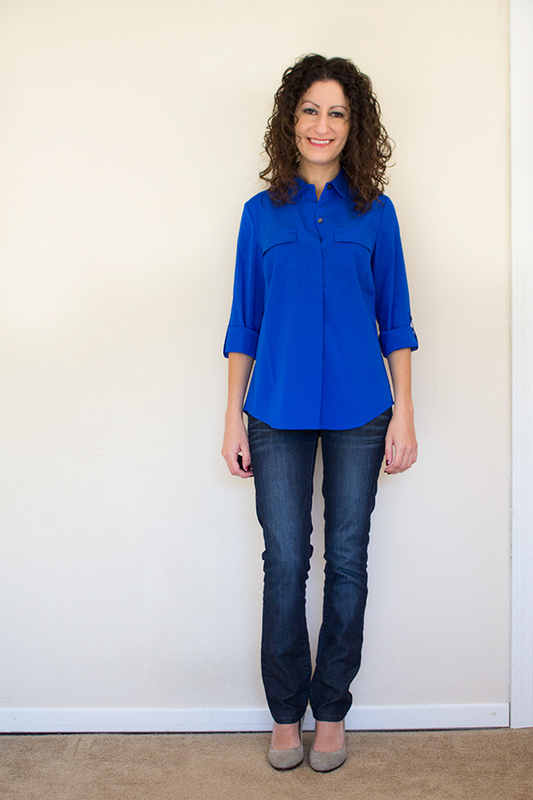 I love the cobalt blue blouse–that color is just stunning! I think you should keep it. I think it could work if you half tuck it into jeans or pants, or fully tuck it into a pair of high-waisted shorts, which would mask the wider width of the blouse. It comes in XXS and Express runs smaller than most other stores in the mall. These blouses are new to me but I recently thrifted a brown/sienna silky blouse with the same cuff. I took it to the tailor as the sleeve was too long. Like you say, it would have worked better with a stiffer material like cotton. The cuff kept wilting down so my tailor pinned it together. What’s more, like you, the cuff is so unique that I can’t part with the blouse! Omg that blue silk blouse is so gorgeous! The blue is so pretty. Is it silk? What’s interesting is that these blouses are very reminiscent of the pajama craze going right now. Hmm, I wonder if that’s the inspiration for Ann Taylor… Either way, they look gorgeous and comfy! Hi Suzylou! 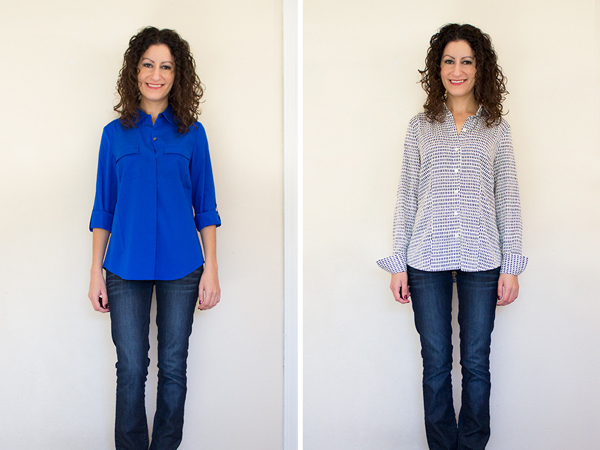 The blue blouse is 93% silk 7% spandex. If you ever get tired of the same old petite brands, I recommend that you try designer Asian brands. I found some pretty unique styles at yesstyle.com. Most of the tops only come in one size, and best fit someone who is about 5’1 and 100 pounds. That happens to be my size. Having only one size did strike me as add at first since I’m so used to US conventions of at least three sizes. But it makes sense when you think about how there is less size variation in Asia. The downside is that you are going to wait two weeks for the items to be shipped to the US, and if it doesn’t work out you are stuck having to pay international shipping if you want to return anything.